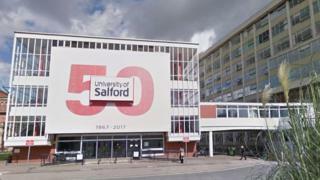 Accounting firm Grant Thornton has been fined £3m by a watchdog for misconduct over its audits of Vimto-maker Nichols and the University of Salford. This related to former senior partner Eric Healey joining the two organisations' audit committees despite being employed for consultancy work. The Financial Reporting Council (FRC) said this created "serious familiarity and self-interest threats". A Grant Thornton spokesman said it had fallen short of expected standards. Three of the firm's senior auditors also admitted misconduct. The FRC fined Mr Healey £200,000 - discounted to £150,000 on settlement - and excluded him from the Institute of Chartered Accountants for five years. It has also imposed penalties on three senior statutory auditors - Kevin Engel, David Barnes and Joanne Kearns - following their admissions of misconduct over the audits. The watchdog said Mr Healey's actions had resulted in "the loss of independence in respect of eight audits over the course of four years" between 2010 and 2013. An investigation also revealed "widespread and serious inadequacies in the control environment in Grant Thornton's Manchester office over the period", according to the FRC. The overall penalty was reduced after settlement from an original fine of £4m, while the watchdog also said it had reprimanded the firm. A spokesman for Grant Thornton said it was "regrettable that we fell short of the standards expected of us on this occasion". He said the focus of the investigation was "not on our technical competence" but "the matter of ethical conduct and independence is equally of critical importance in ensuring the quality of our work". Last year, the firm was fined £2.3m over failings in its audit of a company called AssetCo.